This is the location of the bridge on Bridge Street in Kemptville. Taken around 1890, it shows the swing bridge built to allow boats upriver to Prescott Street. 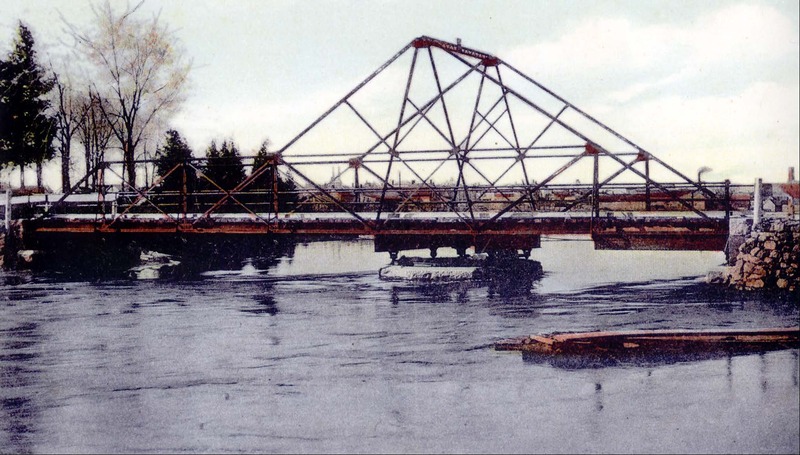 It was erected to replace a log bridge that had been swept away by flood waters. The bridge was adjacent to a mill established by the Clothiers about 1877, and the wharf at the site was an important loading area for goods coming and going along the South Branch. The village of Kemptville can be seen in the distance, and notice how built-up the riverbank was beyond the bridge. The stretch of the river up to Prescott Street was the industrial centre of the community, with wharves, warehouses, and factories producing furnaces, cheese boxes, furniture and other goods. In 1959 it was declared unsafe and demolished. It was replaced by the current bridge in 1961.